Tempo Argeon was actually the first deck I built towards when I started the game, I had already from other games decided that the white armor dudes were probably the best starting faction, something that actually turned out to be fairly true. Argeon is a good starting point for players as he teaches some good fundamentals about positioning minions and the basics of trading, but is definitely deep enough to rewards players that start learning quickly. The deck plays a tempo style which means it looks to be ahead of the opponents early in terms of board presence and Initiative, and then parley that into enough face damage to secure the victory. To explain that a bit more Tempo decks are about being ahead of your opponent. I’m not going to go into a deep description of tempo, I would probably only do a poor job, but the basics are that you want to be playing at a faster pace, being a step ahead of your opponent. An easy example would be if you start with a 2 drop, then your opponent goes and plays a minion, you cast a cheap removal and another minion and are now ahead on board. If you do this for a couple of turns your opponent way be way behind facing down 2 or 3 minions with none of their own. Tempo Argeon looks to enact this strategy by playing cheap, by strongly statted minions that can destroy and survive minions of the same cost, and/or use Roar to trade up to destroy your opponent’s more costly minions. If your minion survives combat then a Holy Immolation can often heal it backup as well as pushing face damage AND destroy the enemy’s minion(s). Once you have secured board superiority you can turn your attention to the business of smacking the enemy directly to hopefully put them to 0 HP before they start deploying larger threats that survive your early game minions. If they do manage to escape on a low HP then the deck has some burst damage (eg. Saberspine Tiger, Roar, Immolation, Tempest) to end the game with. So it probably makes sense to start by talking on this one, since it’s the major spirit cost of the deck, it’s a quite nice and cheap deck without it, but it’s such a Lyonar staple that it makes sense to craft it early if you know you’ll be playing the faction. If you’re not sure or don’t have the spirit the isn’t really a replacement per se, but Frostbone Naga does a mini version of the effect, or Repulsor Beast is a good option if you’re having trouble with large enemy minions. But if you do craft it Immolation is a way to clear multiple small minions, heal up your own minions and get face damage in while you do. Alchemist is good enough that I could talk about it by itself, the ping is exceptionally valuable to clear up eggs, artifacts and low HP minions. It also plays a crucial role for enabling Holy Immolation from an empty board as early as 5 mana. But it is worth it to talk about these 2 together as they are part of a very powerful Player 2 opening where you cast Bloodtear on the tile and then Arclyte in the center which clears any 3 HP minions, takes centre tile and develops 2 minions to control board. But even without that both of these minions are great to be able to clean up enemies whilst also creating minions that can be used for damage or board control later and give targets to Roar if there aren’t better ones. Finally if you’re looking for a last little bit of damage these can sometimes provide it. Another Similar minion that provides a body and a potential clear is DBlades. The body on this minion is real nice and it provides a bit of top end for the budget of the version of the deck, and is just an all round excellent budget card that fits the deck quite well. Next up are the main 2 drops for the deck. Primus Fist Actually works similar to the above minions, but with the caveat that you need a minion in range and on board already. It’s a great tool for trading up or getting extra face damage in. Combined with roar you can have even small minions like Sun Wisp & Alchemist trade into 6HP minions, which lets you keep the board clear cheaply and deploy more of your own guys. Guys such as Azurite Lion & Windblade Adept, Adept is just a great statline, it used to be 4/3, which was pretty great, but even at 3/3 it can trade into most other 2 drops and survive. Azurite Lion is fantastic, celerity is an amazing keyword, partly for the mobilty it provides, but if you remember those buffs I was talking about earlier? you can get some crazy damage by pumping up your Lion’s attack. These provokers are to keep the enemy locked down and unable to back off for defence or favorable positioning. With a slightly larger health pool these guys are more likely than some of your other minions to stick around which can make these decent Roar or Immolation targets on the right occasion. Silverguard can come down real early and be tough to cleanly answer for the early stages of the game, Shieldmaster is like the extra copies, but sometimes being strong even out of Zeal range can be excellent. These guys are purely here to give a bit of draw & cycle to the deck. The deck has quite a low curve, and can get through cards fairly quickly. Of course it also looks to win quickly, but there will definitely be games where you appreciate the draw. Missing it’s glory days when it cost 3 mana Tiger is less good than it used to be, but is still a good tool for Argeon, particularly on a budget. With Roar it’s 5 damage where you want it, and at 9 mana you can use that to also place immo and get 9 damage from a fair distance. Last but not least is tempest. It’s a great card, but don’t use it stupidly. It’s some nice aoe that can clear swwarms, clean up blockers or certain backline problems as well as push some face damage. It’s kinda obvious but don’t use it when you’re killing your own stuff unless there’s some pressing threat and you have to sacrifice some grunts to answer it. The Ordinary upgrade path is normal tempo Lyonar; get Trinity Oaths, Regalia, maybe Spelljammer too. The alternate upgrade path is to get 3 Alabaster Titan’s and perhaps a Sunbreaker instead of the spells currently in the deck. 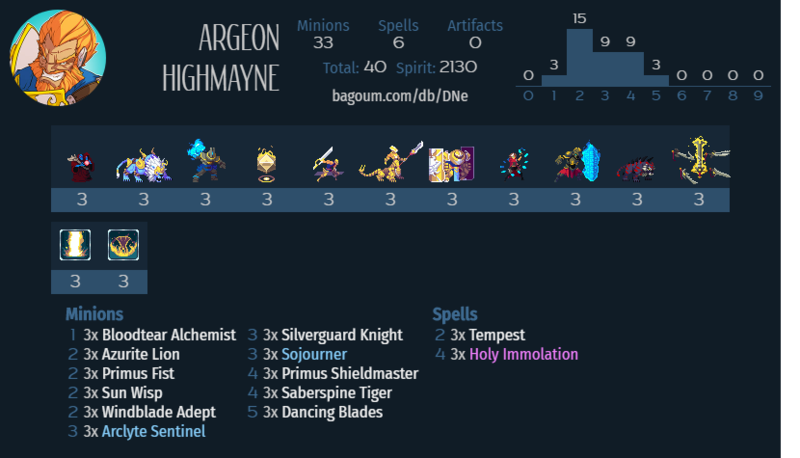 LeTigress is good as a final craft in either of these Argeon decks too, but niche outside of Argeon. Sunset Paragon is good tech in both decks for answering Wanderer and other evenly statted minions, or for some aoe. Lightbender or EMP are options for dispel. By the time you have worked towards either of these I’d expect you’ll have formed your own opinions for what to add or remove to the deck.